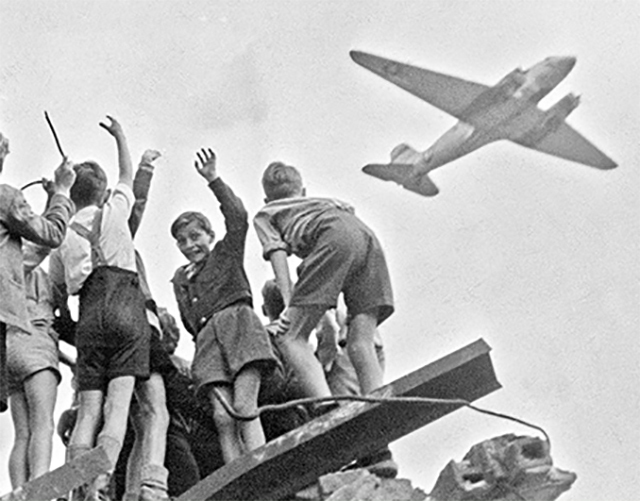 “The Candy Bomber” | Kid Reporters' Notebook | Scholastic Inc.
German children stand atop a ruined building in the western section of Berlin in 1948, cheering as a U.S. cargo plane arrives with food, fuel, and other supplies. Many children also got candy. When World War II ended in 1945, much of Europe was in ruins. The conflict, which began when German dictator Adolf Hitler invaded Poland in 1939, had claimed millions of lives and destroyed cities and towns. After the United States and its allies defeated Germany, the allies divided the war-torn country and its capital, Berlin, into occupation zones (see map). But in 1948, the Soviet Union, led by dictator Joseph Stalin, wanted more control in the region. The Soviets blocked rail and road access to the western section of Berlin, leaving more than 2 million Germans without food, fuel, and other necessities. Halvorsen is known throughout the world as “the Chocolate Flier,” “Uncle Wiggly Wings,” and, most commonly, “the Candy Bomber.” At 94, he still delights crowds by dropping delicious gifts from the sky. His experience during the Berlin Airlift, he says, shows the importance of helping others and being thankful.